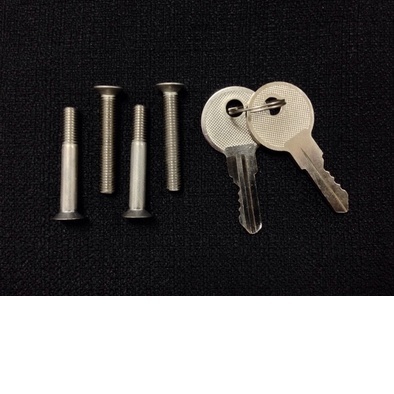 AECI - Aircraft Parts, Engineering and Manufacturing Services - Handle Lock Assembly. 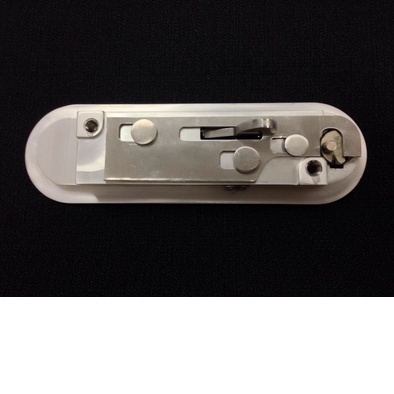 FAA-PMA Approved superior and everlasting, AECI P/N H2532-13AEC, Door Handle and Key Lock Assembly. AECI Door Handle and Key Lock Assembly is made of far superior aerospace metal materials, never corroding, and never breaking and everlasting design, is a once in a life time replacement product. 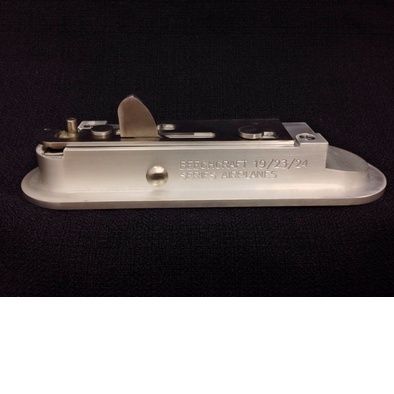 Replaces the plastic Hartwell door handle for Raytheon/Beech, P/N H2532-13. One Door Handle and Key Lock Assembly needed per main cabin or baggage compartment door. See list below for applications. The above serial numbers encompass many Sports, Sundowners, and Sierras, essentially 1974 through 1979 for the Main Cabin Doors. Some used the H2532-13 on all three Doors, while others used it only on the aft baggage door, as a subassembly of the H2532-7 (Small Baggage Door) and H2532-9 (Large Baggage Door) latch assemblies. 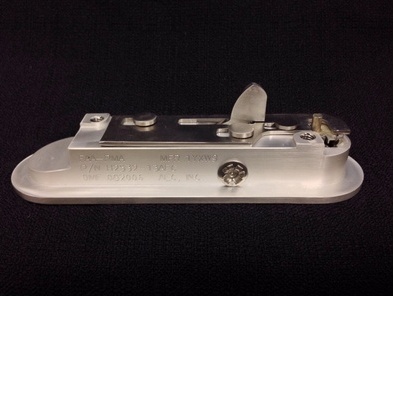 The Duchess twins used this exterior handle only as a subassembly in the large baggage door latch assembly, P/N H2532-9, used in Serial Numbers ME001 through ME221 (1978 and early 1979). The IPC shows no Duchess usage on the front cabin doors. The IPCs for the Models 19/23/24/76 contain many application inaccuracies, due to substitutions made on the plant floor during production. Please identify your exterior handle type from the illustrations. An essential indicator is the placement of the lock cylinder. If the lock is adjacent to the exterior handle in the housing, and does not move as the handle moves, your exterior handles are the Hartwell H2532-13. They cannot be incorrectly applied, as the two mounting screws are staggered. The other Beech style used horizontally aligned mounting screws, and the lock is located in the moving portion of the exterior handle. An incorrect handle cannot be accidentally installed; it would require modifications to the inside latch assembly. 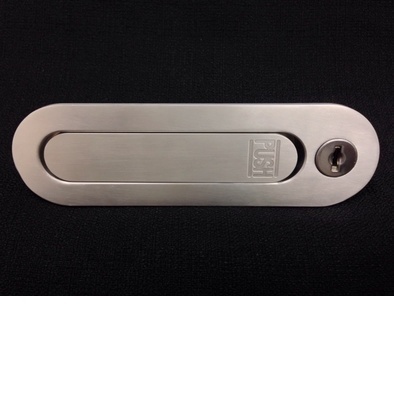 These PMA'd handles are legal replacements for all the Hartwell exterior handle assemblies and subassemblies having the same appearance and configuration; i.e. the lock cylinder is in the housing, but adjacent to the movable handle (as opposed to being mounted in the moving handle). Beech did not list this -13 subassembly separately in all the baggage door IPC latch diagrams, but Beech Technical Support will confirm that the H2532-13 was used. No other Beech handle with this profile had the same segregated lock cylinder configuration. The AECI External Door Handle and Housing Assembly is far superior to the original chrome-plated plastic handles, which were made by Hartwell for Beech Aircraft Corporation. The AECI handle housing is made from a superior grade of aircraft aluminum, which has been treated to survive all environmental conditions. Unlike the original plastic handles, the AECI handles will never break from normal handling, cleaning solvents, oils, or temperature variations. The AECI Door Handle's internal components are made of non-corroding and wear-resistant stainless steel, complementing the expected long life of the aluminum housing and handle. To ensure ongoing original ignition switch and door key compatibility, the new AECI handle assemblies were engineered to use the same original-style lock cylinders and keys. It is expected that with the improved materials and construction of the AECI door handle assembly, the original-style lock cylinders will hold up very well in service. Unlike the remaining available replacement Beech-Hartwell plastic handles which OEM sells without a lock cylinder, each AECI handle includes a new lock cylinder and a pair of keys. As the lock cylinders are not factory-sorted, if you purchase multiple handles, the new lock cylinders would normally all differ. Most of the original Beech lock cylinders are in very poor condition, and many no longer work at all. If your locks are still original, we recommend that you purchase multiple Door Handle and Lock Key Assembly sets at one time. A Certificate of Conformance will be sent with each order for your aircraft logs.